Airway management of patients with maxillofacial trauma is complex and crucial because it can dictate a patient's survival. Often, the status of the cervical spine is unknown in the acute setting, and care must be taken to prevent inadvertent neurological injury. Airway management is a unique and a defining element to the specialty of Emergency Medicine. Failure to secure the airway can drastically increase the morbidity and mortality of the patient within few minutes. Here, we report a case of a young man with shattered mandible following gunshot injury, presenting with airway compromise. Our emergency team successfully managed his airway, and he got operated and successfully discharged without any morbidity. Trauma is probably the most serious of all the major health problems faced by the developed countries. In the developing world, the impact is just as great but has not been as extensively studied. The priority in these patients is airway maintenance with cervical spine control and Advanced Trauma Life Support (ATLS) concept for patients who sustained life-threatening injuries. Gunshot wounds to the face often present unique challenges in the airway management due to significant tissue loss and less frequently, associated hemorrhage. The need for emergent airway control in these patients ranges from 17% to 35% in recent reviews. Many authors recommend elective intubation even if the patient is initially stable to prevent delayed airway compromise, especially in patients with mandibular injury, oral bleeding or edema, and close-range shotgun wounds. A 30-year-old man had allegedly shot himself by placing a gun under his left chin. When he was brought to our emergency department, he was conscious and oriented. Airway – there was extensive soft-tissue injury involving left side of the face, with diffuse edema involving oral cavity, chin, and face. Hence, we anticipated airway compromise and placed him on high-flow oxygen by nonrebreathing face mask. Breathing – the chest was normal, bilateral air entry was there. Circulation – he was hemodynamically stable, focused abdominal sonography for trauma was negative, disability – Glasgow coma Scale was 15/15. 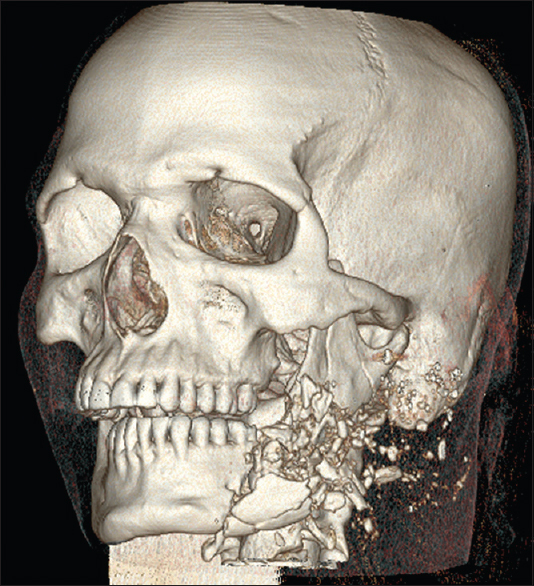 His computed tomography (CT) facial bones [Figure 1] revealed shattered body, angle, and ramus of the left mandible. Maxillofacial surgeons were informed. Meanwhile, the patient started sweating profusely; developed breathlessness, and drop in oxygen saturation. Immediately, we prepared for rapid sequence intubation. In the view of difficult airway, paralytic agent was not given initially. Intubation was tried under sedation. During the first attempt, we were able to visualize vocal cords but could not intubate due to the patient's resistance. Then, the patient was paralyzed by giving succinylcholine and intubated with 7.5 size endotracheal tube. ET tube position was confirmed using end-tidal CO2. After 10 min, the patient's respiratory efforts recovered, later he was kept with T-piece with oxygen support. The facial wound was thoroughly irrigated with normal saline. Intravenous ceftriaxone and metronidazole were administered. Later, he was taken up for surgery by maxillofacial surgery team. Intraoperative findings were fractured mandible with multiple shattered bony fragments. Using extraoral approach, thorough debridement was done, and the mucoperiosteal flap was elevated raised to expose the fractured segment. Multiple nonviable fractured segments were removed, and intermaxillary fixation was done. Mandibular fracture was fixed with 25 recon plate and closure was done in a rotational flap with drain. Drain was removed on the 3rd day, and the patient was discharged a week later without any morbidity. His 6th month follow up was uneventful [Figure 2]. Airway patency may be compromised by direct laryngeal injury, aspirated teeth or bone fragments, and excessive bleeding. Airway compromise can also occur when the floor of the mouth and tongue lose critical underlying support and swell substantially. The trauma team should have a low threshold for airway protection through endotracheal intubation or tracheostomy. Treatment of the compromised airway is complicated by a 10% incidence of cervical spine injuries in this patient population. In our patient, initially his airway was maintainable, but with few minutes, his airway was compromised. Identifying compromised airway is the key in the management of any critically ill patient. Regardless of the associated injuries, the primary means of securing the airway in the vast majority of acutely desaturating patients with maxillofacial trauma is orotracheal intubation through direct laryngoscopy. Suction is often necessary to clear pharyngeal secretions and bleeding. Gum-elastic bougie may be used in patients where visualization of the true vocal cords is difficult. Use of video laryngoscopes in trauma patients has not yet been described. In patients with significant trismus, fiberoptic-assisted nasotracheal intubation is a valuable asset. Blind nasotracheal intubation poses a risk of intracranial placement of ET tube in patients with extensive cribriform plate/sphenoid sinus fractures. Additional choices for managing the emergent airway include the intubating laryngeal mask airway, esophageal/tracheal double lumen airway, lighted stylet, and retrograde intubation. When attempts at intubation or ventilation have failed, cricothyroidotomy is considered the procedure of choice. The relative ease in locating the cricothyroid membrane and its proximity to the skin allow more expedient dissection compared with an emergent tracheostomy. In our patient, we identified the compromised airway and managed appropriately. CT is the gold standard for determining the nature of complex head and neck injuries. Although plain radiographs are sufficient for diagnosis, 1-mm CT axial views from the top of the cranium through the bottom of the mandible can better define the complexity of injuries. CT scanning is most valuable in the assessment of suspected high-condylar fractures that are difficult to see on plain radiographs. Facial gunshot wounds frequently consist of contaminated and profoundly injured local tissue. Initial soft-tissue management involves decontamination and debridement of the wounds to prevent dead space formation, minimize wound tension, and evert the wound edges. Before closure, all foreign debris must be removed from the wound. Correction and stabilization of skeletal dimension should be attempted after debridement and irrigation are completed. Restoration of anteroposterior projection and width of the face should be the primary goal of skeletal reconstruction. When a mandibular fracture is a component of gunshot wounds, reestablishing mandibular continuity and occlusion first is advisable. External fixation may be prudent in the event of extensive bone comminution with minimal soft-tissue damage. Internal plating should be used for reconstruction in the majority of the remaining instances in which bone fragments are large enough to accept screws. 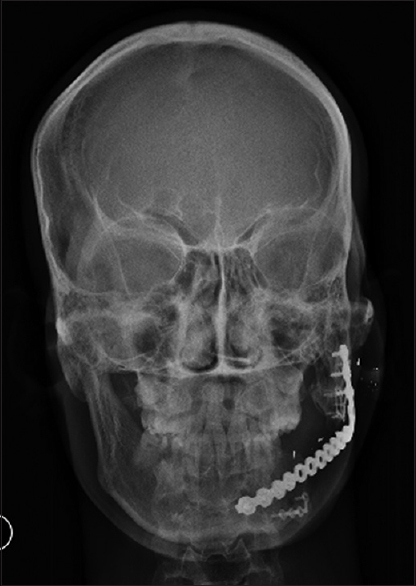 Whereas mini plates typically suffice for the cranium and mid-face and large (2.4 mm) locking plates are typically used on the mandible. Gunshot injury to face is a life-threatening emergency which requires emergency resuscitation and aggressive management of the airway. Delay in establishing a patent airway may increase morbidity and mortality of the critically ill patient. All emergency physicians should be well trained in identifying compromised airway and timely intervention in airway compromise. Raval CB, Rashiduddin M. Airway management in patients with maxillofacial trauma – A retrospective study of 177 cases. Saudi J Anaesth 2011;5:9-14. American College of Surgeons Committee on Trauma: Advanced Trauma Life Support for Doctors ATLS. 7th ed. Chicago: American College of Surgeons; 2004. p. 1-391. Kellman RM, Losquadro WD. Comprehensive airway management of patients with maxillofacial trauma. Craniomaxillofac Trauma Reconstr 2008;1:39-47. Dolin J, Scalea T, Mannor L, Sclafani S, Trooskin S. The management of gunshot wounds to the face. J Trauma 1992;33:508-14. Rana M, Warraich R, Rashad A, von See C, Channar KA, Rana M, et al. Management of comminuted but continuous mandible defects after gunshot injuries. Injury 2014;45:206-11. Kaufman Y, Cole P, Hollier LH Jr. Facial gunshot wounds: Trends in management. Craniomaxillofac Trauma Reconstr 2009;2:85-90. Mohan R, Iyer R, Thaller S. Airway management in patients with facial trauma. J Craniofac Surg 2009;20:21-3. Hollier L, Grantcharova EP, Kattash M. Facial gunshot wounds: A 4-year experience. J Oral Maxillofac Surg 2001;59:277-82.